Black Marisse | A Black Odyssey. A journal of a voyage through the void. In the right light, even the ugliest place can look beautiful. You don’t know where Belevnis is, and that’s okay. 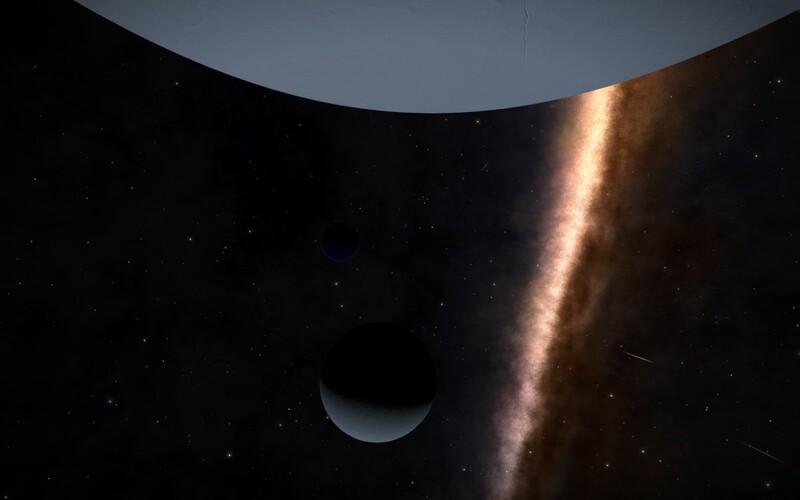 It’s one of those inner frontier kind of worlds: far enough from the well-travelled space lanes that it’s hard to find a meal that didn’t come out of an AutoChef, but close enough that the only unpopulated systems tend to be the ones without planets. You know the kind: empty enough to have minimal Authority presence, but busy enough to attract pirates. That, in fact, was what brought me out here. Don’t be fooled; Sol is about 400 light years away. I’m a journalist by trade, though my credit balance informs me I am not a very good one. Searching for the next big story, the one that would finally make my reputation, I read about the problems faced by frontier asteroid miners. This is a trade with no winning strategies. The inner systems have either been cleaned out or are mass-mined by interstellar corporate giants – there’s no entry point for one miner and her ship. Unknown space is rich with resources, but when your battered old ship is the only real asset you have, these systems are hopelessly out of reach. The only possibility for most of them lies in between, around those stars on the civilised fringe: minimal corporate interference, but reachable even by the most battered old Hauler with a third-hand frame shift drive. Three ships in 24 hours. 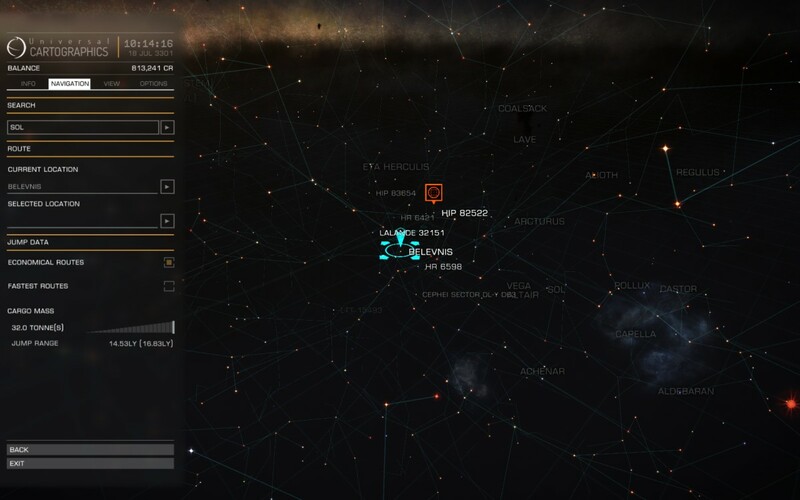 Not exactly a bustling hub. Periodically, an unusually rich and accessible resource site will be found by a random surveyor craft, and the rush will be on. These miners aren’t racing other miners, though: they’re trying to beat the pirates. 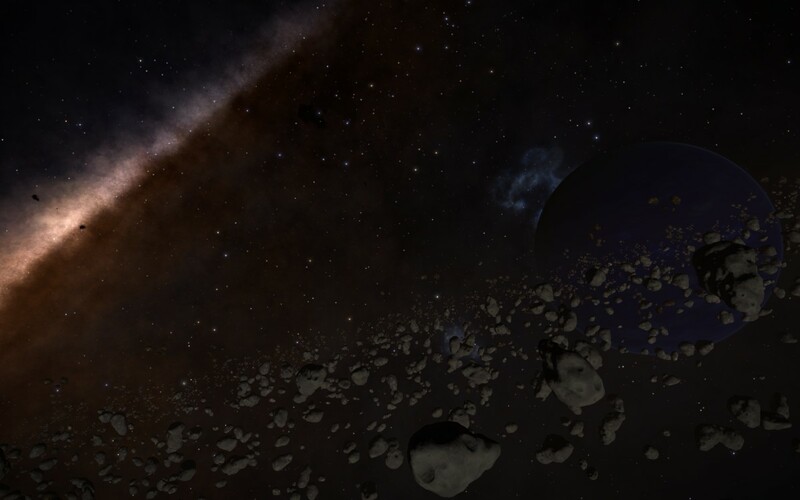 Mining asteroids and gas giant rings is slow, precise work, so many figure they can simply wait for others to break the rocks up and pack their on-board refineries full, and then they’ll just steal it. This is the pattern that repeats and repeats, in countless systems dotted all over the vast galactic fringe. Local authorities do their best with aging Eagles and Vipers, but too many miners are robbed and, in a shocking number of cases, killed. This, then, would be the story that would finally launch my career. 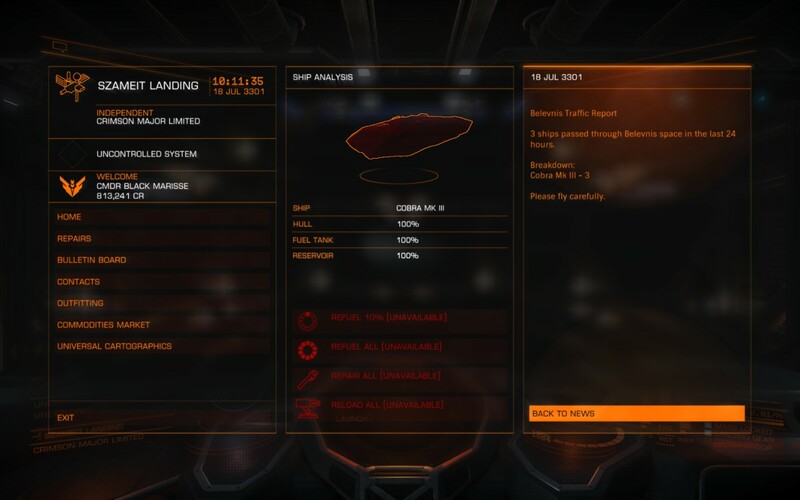 I talked a newscast editor of my acquaintance into paying for my fare, squeezed into the back of an asteroid miner’s rattly old Adder – no cruise liners heading out this direction, I’m sad to say – and before I knew it I was disembarking onto Szameit Landing. To call it “the middle of nowhere” would falsely suggest it’s in the middle of something. Szameit is an ugly orbital platform with a nice view. It’s too small to rotate, so I spent the entirety of my visit floating. It’s a strange experience for somebody who has spent his entire life in the embrace of either gravity or a sturdy safety harness. The locals were used to it, of course, and they flitted about like overall-clad dirigibles, swooping down narrow, grimy corridors with only a single finger sliding along the safety rail. They were oddly elegant, perfectly timing their turns and stops; they reminded me of the months I lived on the Gidzenko Ring, and used to eat my lunch while watching the ponderously large agricultural transports slipping through the narrow dock entrance and hovering quietly to their assigned hangars. In comparison, I was a wayward chunk of debris. I attracted many laughs, and a few less-politely worded versions of “get out of my way”, as I doggedly pulled myself hand-over-hand along the handrails. That was how I met her. I was edging my way down a narrow metal tube, which I had been assured was the route to the corporate headquarters of Crimson Major Limited, Szameit’s governing authority. I had met an obstacle: a woman was asleep in the corridor, one arm locked around the safety handrail in what I assumed was a well-practised anchoring technique. An empty liquor box rotated slowly near her knees like a tiny satellite, giving some context to both her current state and the fact that she was snoring. A glance at the back of her head told me she was a lifetime spacer. There are signs you can spot with enough experience: hair clipped almost to the scalp for easy helmet connection, a slender but wiry build from too much high protein synthetic food, a certain hunch to the neck and shoulders caused by days at a time strapped into a pilot seat, and of course the fact that she could sleep while free-floating in zero gravity when greenhorns like me can barely get to sleep strapped into a SlumberPod. With significant difficulty, I crossed to the other side of the corridor and grabbed a light fitting, then grasped a ventilation grille with the other. I carefully aimed through the small gap she had left beside her, and kicked off. As I glided past, I saw the name tag on her charcoal-grey flight suit: “Black Marisse”. A moment later my head connected with the next light fitting along, and I shouted a word that would have made my mother blush and my grandmother give me a slap. Behind me, I heard a grunt, then a cough, then renewed snoring. I regained a grip on the handrail and continued on my way. Sure enough, the corridor ended at a hatch stencilled with the words CRIMSON MAJOR LTD. In the middle of the second M was stuck a small hand-written sign that read “closed sat and sun come back mon”. The same word escaped my lips again, and 200 light years away I’m sure my mother’s face was burning for no reason she could explain. “They’re closed,” said a deep, sandpapery voice behind me. Had I not been floating, I would have jumped. Instead I just kind of spasmed. I turned, and there she was, wide awake and apparently no worse for wear. I tried to think when the snoring had stopped, and I was certain it had continued until the precise moment she had spoken. Had she been pretending to be asleep? If so, had she been blocking the corridor on purpose? Wait, had she been faking snoring? Later, I would learn that Black Marisse had a knack for throwing me entirely off guard. Her eyes, like her skin, were a dark brown, very close to black. In the core systems we get used to everyone being a homogenous shade of milky-tea tan, but further out you see clumps of genetic diversity. I passed through one system populated solely by gas refinery workers and their family, and nearly every one of them was ghostly pale, with brick-red hair and greyish blue eyes. Marisse came from the opposite end of the gene pool, darker than perhaps anyone else I had ever met. Suddenly the nametag made sense. Five minutes later we were in the bar. If you haven’t gotten drunk in a zero-g bar, I recommend you try it once, and then never ever do it again. If I can offer you one piece of advice, it is this: use your safety clamp. If, like me, you’re not used to zero-g and, like me, you’re not much of a drinker anyway, then if you don’t clamp yourself in place you will, like me, end up with an enormous bruise on your forehead. Perhaps it was the bump on the head, or perhaps it was the liquor (Marisse called it “ethanol and food colouring”) but four hours later I was strapped into the co-pilot seat of Marisse’s ship, and we were going on a pirate hunt. Coco the Cobra. I’d make fun of her name, except I’m a bit in love with her. After my first impression of Marisse, I wasn’t sure what to expect from her ship. Whatever my expectations might have been, they were not what I saw in landing bay 2 of Szameit Station. In a word, it was beautiful. 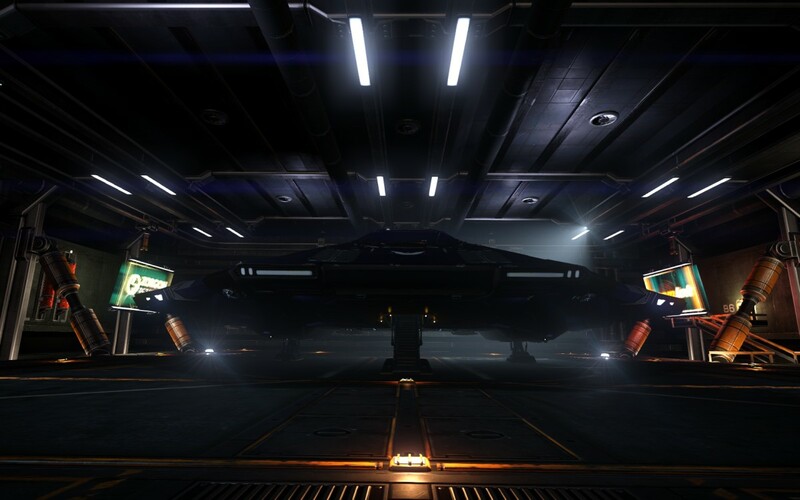 It was a gleaming Cobra, painted a deep, rich purple, and emblems painted in its hull demonstrated that Marisse was a multi-talented woman with official recognition from the pilots’, explorers’, and traders’ guilds. “Oh, I’m sorry,” I stuttered. “Coco,” she said, and I saw a smile touch her lips. “Nothing. I… nothing.” Wordsmith, my arse. The grand ballroom staircase, more or less. As we strapped in and Marisse ran through her preflight with practised ease, she explained where we were going. Surveyors had stumbled across a wealth of precious metals in the outer ring of Belevnis 6, and every miner within ten jumps had converged to blast out a fortune. It was what was known as a “high intensity extraction site”. “I call it a boom site,” Marisse said, smirking like she’d made a joke. The docking platform started forward with a lurch, and I suddenly realised the sheer idiocy of what I was about to do. “Oh, what am I doing?” I croaked. Supercruise. It really is an insane way to travel. Coco pulled away from the station, as as soon as we were out of mass lock range Marisse punched the frame shift drive up to supercruise. I dislike faster than light travel at the best of times, when strapped comfortably in a passenger compartment, but seeing it directly through the cockpit canopy damned near popped my skull right open. There’s just too much happening at once, and far too quickly. One moment we were cruising away from the dock at a few hundred metres per second, and then BAM, the deep blue gas giant in the distance was suddenly sliding away behind us. The complete lack of inertia also bothers some primitive part of my brain. I should be a pancake right now, says that reptilian lobe in the base of my skull. This is impossible. She was interrupted by the comms crackling to life. “So, my information was good,” drawled a deceptively mild voice, given a gritty, metallic edge by the trans-supercruise audio transmission. Marisse glanced up at the comms panel, then over at me. Her eyes were unreadable. Concern, perhaps? Anticipation? Maybe even a touch of triumph? I followed her eyes to the panel; the speaker was someone called Solyn. Marisse tapped some keys and an orange model of his ship appeared, hovering over the control bank. It was a Viper, a favourite vessel among pirates. Marisse didn’t reply, but turned to me. “Seal your helmet, and hang on tight.” As she said it, she touched the environment seal button on her own helmet, and the clear visor snapped into place. Suddenly, everything was wrong. The smooth, inertia-free feeling of supercruise was replaced by a thudding, shaking nightmare. Through the canopy the stars whirled madly, and I could see the distinct blue halo of a frame shift drop. “Can you stop it?” I shouted back. “Stop it?” she said with a puzzled tone in her voice, turning to look at me. With a shock I saw the expression on her face: she was pleased. Holding my eye contact, she reached out her left hand and pulled the throttle back to zero. I felt that familiar pop in my guts as the warp bubble around us dissolved. It was at this moment that I became convinced I had stepped into the ship of a mad woman, and that she was about to get us both killed. The sudden silence was startling, but lasted only a moment. Marisse slammed the throttle into reverse and thumbed a large red button on her steering yoke. I felt a slight vibration as sliding hatches opened in the hull in front of the canopy and a pair of enormous guns emerged. “Are you ready?” Marisse asked, with a grin. I had no idea how to respond. There was a blip from the scanner, and there it was, a contact behind us and gaining fast, and here again was Solyn’s voice, smooth and silky now without the distortion. Marisse had stopped grinning. I could see a sliver of her face through the helmet, and it was calm. This is what she lives for, I thought to myself, and again I was sure I was about to die. Then the universe flipped over. We had rotated sharply, and my presumably insane captain had slammed the throttle forward. There in front of us, growing quickly, was the Viper. Coco’s targeting system superimposed a marker over it, and I could see the guns rotate on their powered gimbals to track it. Marisse smiled, and pulled the trigger on her stick. Nothing happened. I was sure for a moment that something was wrong, that the guns had failed –youregoingtodieyouregoingtodie – but then I saw the progress bar projected onto the canopy, superimposing the Viper. Text flashed beside it: “Kill warrant scanner engaged”. “Gotta get paid, kid,” Marisse said. In the next moment, the Viper’s guns were firing. Coco’s shield flared bright blue as lasers and kinetic rounds were deflected. I watched the shield strength indicator drop from full, to three quarters, to almost half. Meanwhile, the k-scan was two thirds complete. “Come on, just shoot him! Let’s go!” The shield dropped below half, and I felt the entire ship shudder. My first dogfight was not enjoyable, but thankfully it was brief. I could never begin to describe precisely what happened – there was laser fire, the hellish roar of Coco’s guns, and that constant whirl of stars – now flying up, now down, now spinning in circles. The inertial forces couldn’t decide if they wanted to cram my head into my ribcage or my legs into my pelvis, so they energetically tried to do both. “Frame shift charge detected,” said Coco. And then the Viper was gone, with only twin streaks of frame shift exhaust vapour marking where he had jumped out. The frown vanished, and Marisse graced me with a genuine smile. “You’re learning,” she said, and she seemed to be impressed with me. She turned her attention to the console and punched us back up into supercruise, then turned back to me. The holographic display hung by my elbow, glowing a warm, comforting amber. I reached out and touched the tab marked “cargo”. I blinked. Hint: pirates don’t much care for marine equipment. “YOU’RE CARRYING TWO TONNES OF GOLD?” I bellowed. “In a system full of pirates! You’re… you’re carrying gold? Two tonnes of it? I… I…” Wordsmith that I am, my power of speech broke down entirely, and I simply threw up my hands and formed my face into what I hoped was a stern and disbelieving expression, but which probably just made me look constipated. “But what about the mining? The extraction site, thing? Whatever?” I sputtered. The universe lurched and the stars danced. We were being interdicted again. We slammed back into normal space, and I frantically watched the contact scanner. Two blips appeared. Once again, the comms came to life, and I could see that the speaker was a woman called Paine. I briefly wondered if it was her real name, or if she just couldn’t spell. Laser fire pummeled our shield from behind. Marisse deftly closed her visor with one hand and redirected power to the shields with the other. 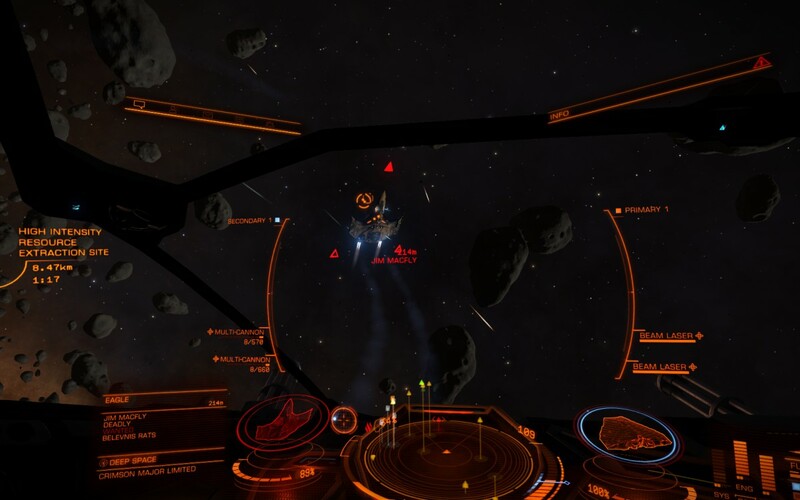 The targeting scope showed us Paine’s Eagle, an ex-Federation military vessel often bought second hand by pirates, then flicked over to the other contact. My eyes widened: it was Solyn. 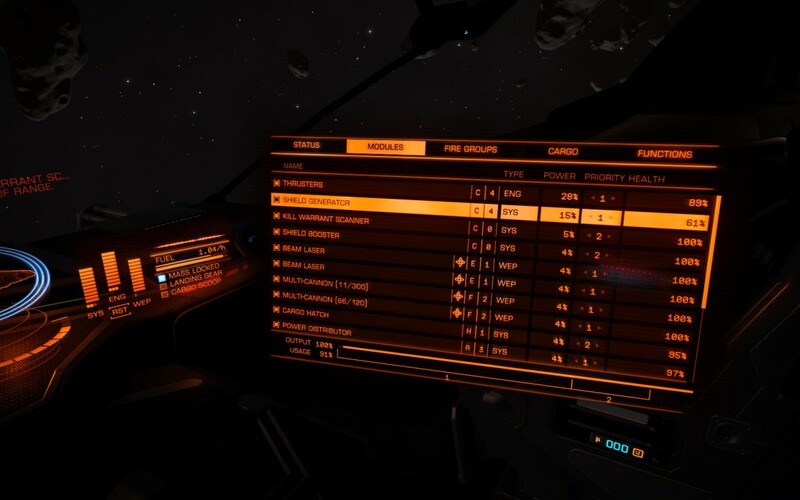 The ensuing fight was quicker and easier than the previous one; an Eagle is nowhere near the standard of a Viper, and Paine wasn’t half the pilot Solyn was. Marisse even took a moment, in the midst of the fight, to target her with the k-scan. Seconds later, there was a flash, and the Eagle was gone. I stared. I had seen recordings of dogfights, of course, and warfare. I’d seen famous footage, like the destruction of the Addington May. In a way, I suppose I’d seen hundreds of people die, maybe thousands, but never like that. Never right there, in front of me. The woman named Paine, whoever she had been, was now gone forever. With the dogfight over, Marisse wheeled Coco around gently and eased onto the thrusters, bringing us closer to where Solyn was rolling, out of control. 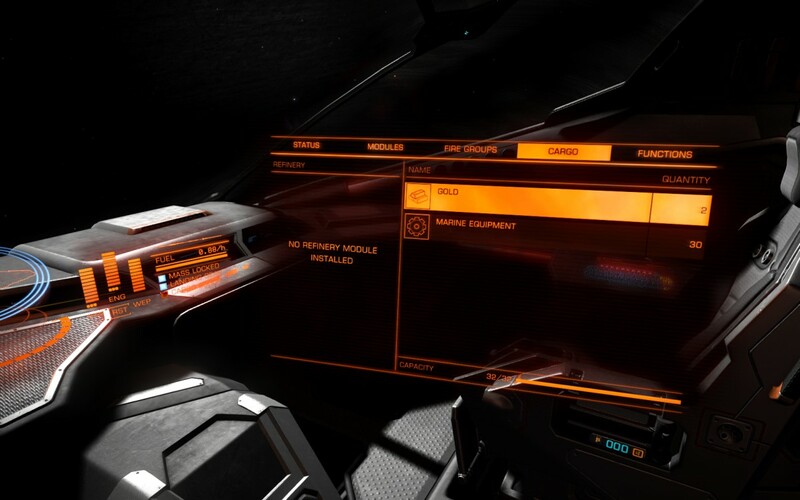 The k-scan beeped to life, and I saw the bar appear on the lifeless Viper. “It doesn’t stick between jumps,” she said. “I… I’m sorry.” I closed my eyes and placed a gloved hand over my face. As the guns fired, I wondered who I was saying sorry to. The work is dangerous, but you can’t beat the view. The rest of the trip continued without incident. Belevnis 6 slowly grew in front of us: first a blue fleck, just another star among billions, then a string of bright beads as its moons became visible, and finally as a perfectly smooth azure orb. An immense silvery ring encircled it, glittering in the now-faint light from distant Belevnis. Marisse slowed Coco and aimed her nose toward the inner edge of the ring, and glowing text appeared on the screen: “High intensity extraction site”. We hadn’t spoken since jumping back into supercruise, but Marisse finally broke the uncomfortable silence. The outer edge of the ring sliced past above my head. I looked up, and I was surprised to see the ring was gauzy and transparent. The golden bar of the galactic hub was clearly visible through the fine speckles of ice and rock. I was struck by its beauty, and despite Marisse’s warning I felt no fear. I claim that rock over there. No, not that one. THAT one. We dropped into normal space, and there it was: a limitless flat plain of tumbling rocks. Marisse guided us closer, and I started to realise how enormous some of these rocks were. The biggest of them were several times larger than the space station we had been docked at only half an hour earlier. Peering at one, I saw a tiny flash. Now that I knew what to look for, I realised there was a lot of activity amid the serene chaos of the slowly-turning stone. 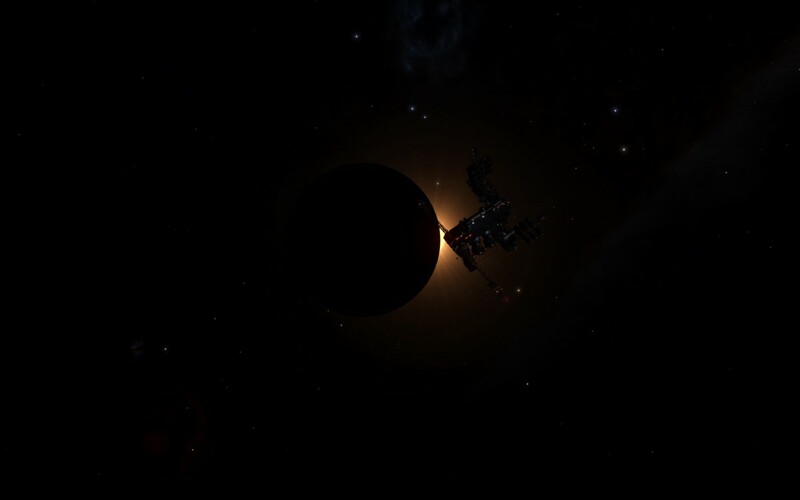 I squinted and could see ships I recognised: a couple of Haulers, an Adder, and even a Cobra like Coco. Having seen her in action, it seemed weird that someone would have one of her sisters hauling rocks. A sudden sound from the comms interrupted her musings. “Please, I’m just trying to mine,” said a woman’s voice. Even over the comms, I could tell she was afraid. Marisse’s hands flurried across the controls as she located the miner’s ship and redirected power to engines and shields. “Hold on,” she told me. “This could get bumpy.” Coco weaved between immense rocks, streaking toward the embattled miner. We couldn’t see her yet, but a razor-thin streak of light strobed against the dark background. “That wasn’t a mining laser, was it?” I asked. “Nope.” She had acquired a target, another Viper, callsign Beowulf. Someone doesn’t know his classics, I thought, remembering how that Scandinavian hero ended up. The k-scan whirred, but Beowulf didn’t even react; he was too busy shooting at a poor defenceless miner in a battered-looking Hauler. With the scan complete, Marisse switched to weapons, and it was over in seconds. Between the lasers and the kinetic rounds, Beowulf found himself in the midst of his own viking funeral before he even knew what was happening. Shields gone. It’ll all be over soon, MacFly. Somehow she managed to drop the shields of each of them in turn, then scan each of them for kill warrants before they could get their shields back online. In quick succession, each became a bright flower of fire and shrapnel, blooming in the dark. Suddenly, everything Marisse had said about the mining site was true. Someone had rung the dinner bell, and the pirates were turning up, mouths slavering. 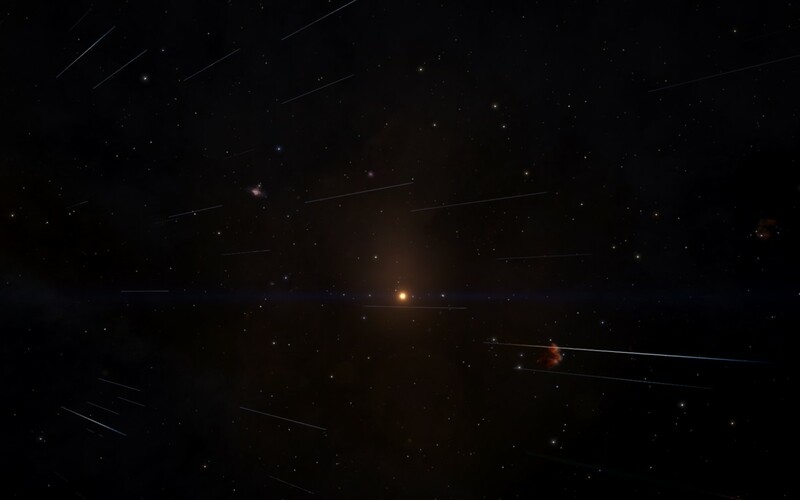 The Adder that first caught our attention managed to jump out, but I saw a Sidewinder – PyroSatanic, the poor misnamed miner – explode under a hail of kinetic rounds. Another Sidewinder streaked towards us, lasers flashing. Coco’s own lasers ripped its shield down, and then we slammed together. I stupidly threw my arms over my face, a worthless self-preservation instinct, but our own shield held. I peeked from behind my arm and saw the Sidewinder spinning out of control; it slammed into an asteroid and, in a flash, was gone. There was a staccato series of beeps, and my stomach dropped as I saw a clump of half a dozen contacts appear together on the scanner. I was about to shout a warning when the Eagle that Marisse had targeted was suddenly ripped apart by a volley of laser fire. “Cavalry’s here,” she said. She was right. The new scanner contacts were local authority ships, and they were here to help. Now, every time Marisse targeted a new pirate, it already had its shields disabled or was suffering hull damage. 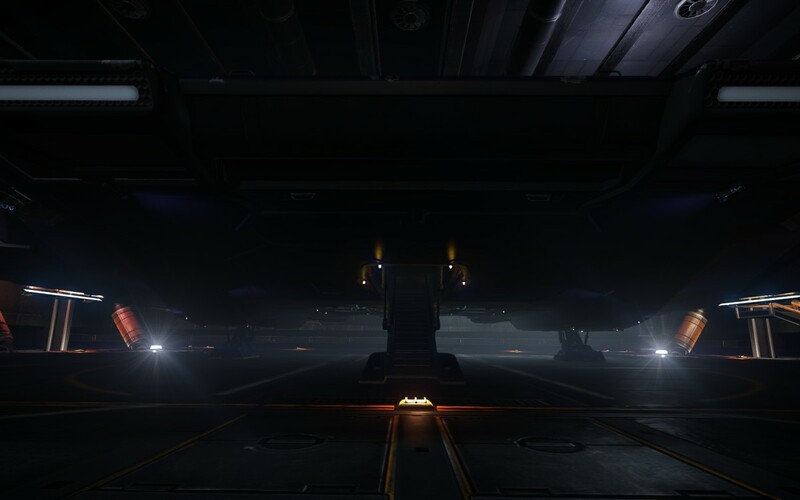 She placed her sights on one Viper that the scanner said had only four per cent hull integrity. In a moment it was gone. “Money for nothing,” Marisse muttered. Then it was over. I had lost count of the number of pirate vessels Marisse had destroyed, but it must have been more than ten. While some parts of my brain felt like the battle had been raging for hours, the more rational parts recognised that it was probably only two or three minutes. I glanced at the ship information panel, which was still telling me about the two tonnes of gold in Coco’s cargo hold. I pressed the “modules” tab, and scanned the list. Marisse was right: the shield generator was at 61%. If we lost it, we’d be defenceless. The frame shift drive powered up and we were gone. 61% is better than 0%, but still about 39% less than I’m comfortable with. Marisse eased the Cobra on course, then dropped her visor and turned to look at me. I was surprised to see concern in her eyes. My stomach dropped. “We’re really not in good shape for a fight…” I began, but Marisse waved a hand gently. “Look closer,” she said, and smiled. 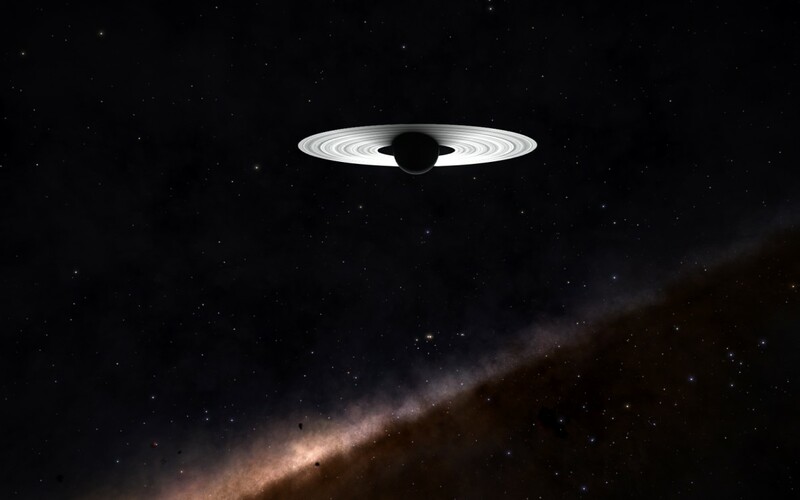 A blue spot slowly grew before us, another ammonia-rich gas giant like Belevnis 6. Like bright beads on an invisible string, several points of light were lined up beside it. “Moons?” I asked. Coco’s planetary scanner came to life; it would seem we had drawn within survey scanner range. 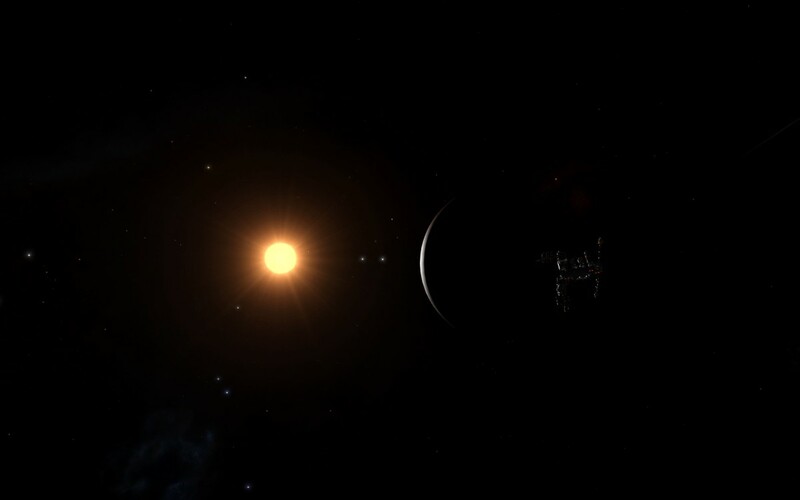 Information about this cold and distant new world appeared on the navigation panel. As I watched, I saw something strange. “Aww, you spoiled the surprise!” Marisse said with mock disappointment. She faked a frown, but I saw something totally new in her eyes: joy. “Marisse,” I said, then paused awkwardly. She laughed and looked at the floor. It seemed talking about things that were truly important to her robbed her of her usual confidence. With delicate motions of the control stick and throttle, she lined us up with the tiny moonlet and the moon it orbited. Behind them hung the deep blue gas giant that held them in its gravity. Marisse gazed at the view for a minute, and then continued. You always remember your first planetary survey. I considered my big story, my would-be career, and my dreams of fame and riches, then I looked again at the icy, desolate beauty hanging outside the ship.